Three senior Mexican politicians were targeted with infection attempts using spyware developed by the NSO group, an Israeli “cyber warfare” company. All three targets are members of the socially conservative National Action Party (PAN). Between June and July 2016 they were sent text messages containing links to NSO’s exploit framework. The findings build on our prior collaborative investigations published on June 19 2017, and February 11 2017 uncovering targeting of Mexican journalists, lawyers, scientists, and public health campaigners using NSO’s exploit framework. On Monday June 19, 2017 Citizen Lab published results of an investigation that revealed that 12 individuals in Mexico and the United States were sent at least 76 text messages in an attempt to infect them with government-exclusive spyware called Pegasus. The targets included prominent journalists, lawyers, and a minor child. The investigation was undertaken collaboratively with Mexican non-governmental organizations R3D, SocialTic and Article 19, which also published a report in Spanish. Pegasus is made by NSO Group, an Israeli company that some have reported is re-branding as Q Cyber Technologies. The majority owner of NSO Group is the United States-based firm Francisco Partners, which is reportedly considering selling the company with a valuation of $1 billion. 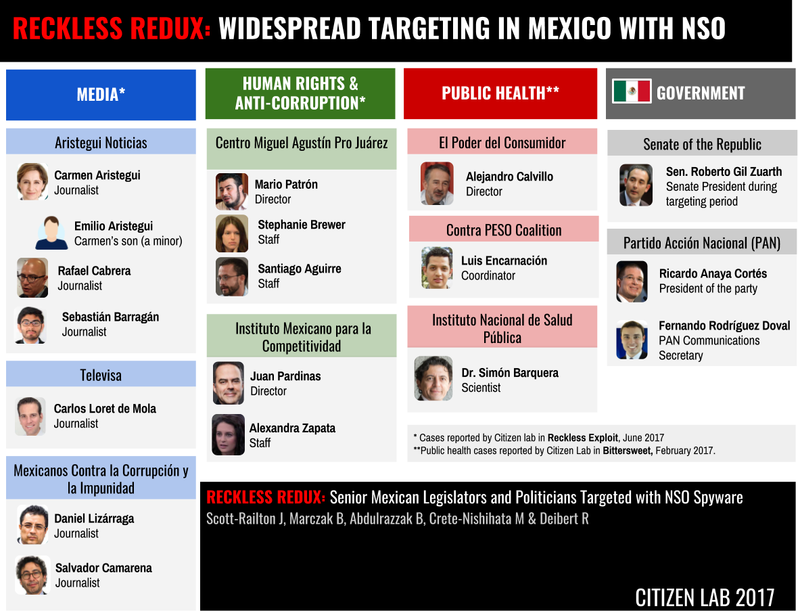 Prior to our June 2017 report, in February 2017, Citizen Lab along with our collaborators, published a report demonstrating that Mexican food scientists and anti-obesity campaigners who supported Mexico’s Soda Tax were targeted with Pegasus. Since the initial announcement, a number of individuals have contacted Citizen Lab and our collaborators with suspicious text messages. After analyzing the messages shared with us, we have been able to confirm that some of these messages contain links pointing to NSO Group’s exploit infrastructure. This report adds to our prior analysis a new category of targets in addition to lawyers, journalists, health scientists, and human rights advocates (and their families): Mexican politicians. This research note outlines three new targets: Senator Roberto Gil Zuarth, President of Mexico’s Senate during the targeting period and member of Mexico’s National Action Party (PAN), Ricardo Anaya Cortés, President of PAN, and Fernando Rodríguez Doval, Communications Secretary for PAN. PAN, a major opposition party, is traditionally viewed as socially conservative, and has provided Mexico with two of its most recent presidents: Vicente Fox and Felipe Calderón. Figure 1: Widespread targeting in Mexico using NSO’s Pegasus. Senator Roberto Gil Zuarth is currently the President of Mexico’s Senate and a member of PAN. Between June 15 and 17 2016 he was sent three infection attempts in the form of text messages with links to NSO exploit infrastructure. The messages echoed themes uncovered in prior Citizen Lab reports of targeting in Mexico, such as the death of a father, and a news story in the Mexican news magazine Proceso mentioning the target. A third message suggests that another political party (Party of the Democratic Revolution: PRD) has been critical of him and his colleagues. The messages pointed to links on the domain smsmensaje[.]mx. Citizen Lab has previously identified this domain as a part of the NSO exploit infrastructure. Clicking on the link would have infected Roberto Gil Zuarth’s iPhone with Pegasus spyware. The Appendix provides further detail on the messages. Ricardo Anaya Cortés is a lawyer, politician, and current president of PAN. On June 15, 2016 he was sent a text message claiming that he was mentioned in an article in Proceso. Notably, his colleague at PAN, Senator Roberto Gil Zuarth received a nearly identical message on the same day. The link in the SMS also pointed to the NSO exploit domain smsmensaje[.]mx. Fernando Doval is the communications secretary for PAN, having previously served as a legislator representing the Federal District (Mexico City) in the Mexican Congress. On July 14, 2016 he was targeted with an infection attempt via text message. The message was similar to messages sent to his PAN colleagues, and claimed that he had been mentioned in an article on Proceso (Figure 4). 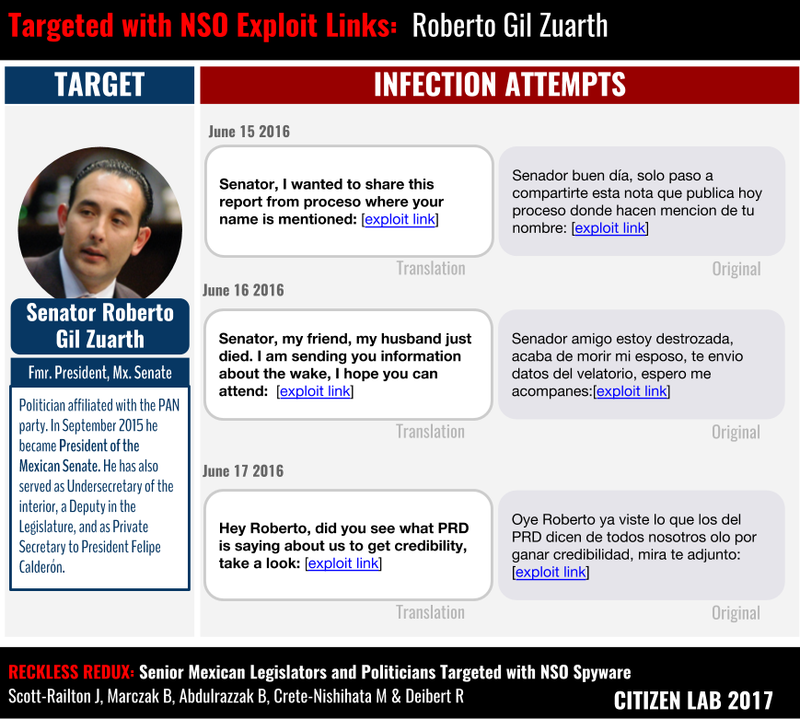 These cases indicate that during June and July 2016 senior Mexican politicians who are members of PAN were targeted with multiple infection attempts using NSO’s technology. While we are not privy to the reasons behind the timing of the targeting, it may be relevant that during this particular timeframe, anti-corruption legislation was being discussed in Congress. This latest discovery is the result of close collaboration between Citizen Lab and Mexican partner organizations, and provides further evidence of the widespread and highly political targeting using NSO’s Pegasus infrastructure. It also reflects the willingness of individuals targeted with infection attempts to come forward and share their cases. Our investigations have now found NSO used against scientists, health advocates, lawyers, journalists, senators, and politicians in Mexico. We hope this finding will contribute to further scrutiny and investigation of the way that NSO’s Pegasus was used in the Mexico, and across its borders. We thank the targets of these infection attempts who have come forward to provide us with the messages, and given permission to publicly describe their cases. Citizen Lab would like to thank our collaborating organizations, including R3D, SocialTic and Article19, for their careful and important investigative work as Citizen Lab continues to investigate the use of NSO technology in Mexico. Without their assistance, the investigative project would not be possible. We also thank Azam Ahmed of the New York Times, as well as additional researchers, including TNG. Special thanks to Citizen Lab’s team. We also thank Amnesty International and Access Now for assistance in earlier phases of the investigation. Full list of messages from the cases discussed in this note.